The Piro / A’tzi-em research includes several related historical and archaeological efforts across the pueblos of Teypana, Pilabó, and Tzelaqui/Sevilleta. 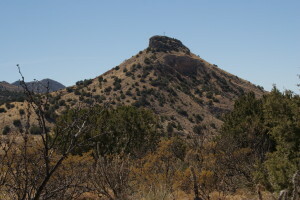 The Guevavi mission was a major focus of Spanish conversion efforts among the indigenous Sobaipuri-O’odham peoplein Arizona. 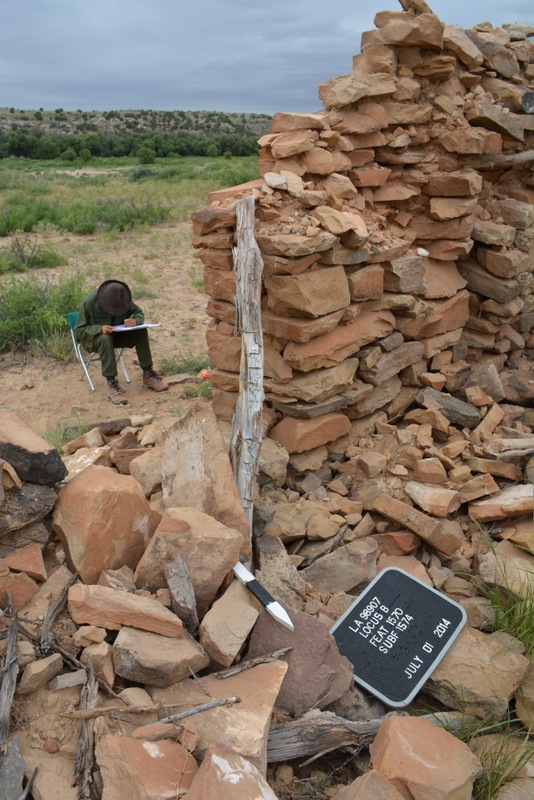 Project Director and JRI Research Associate Deni Seymour believes to have identified the 1751 Jesuit mission among six adobe structures that surround the recognized NPS mission. One of the goals of the project is to date adobe wall samples using the luminescence technique. 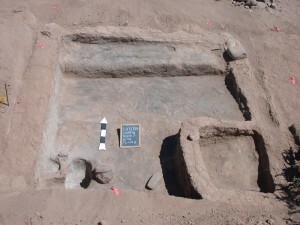 This will inform which of the adobe structures date to (a) the Kino period (1691-1711), (b) 1751, and (c) which are Franciscan or later mining/ranching features. The Los Ojitos Project is a team effort between Kelly Jenks of New Mexico State University and Jeffery Hanson of the Jornada Research Institute. 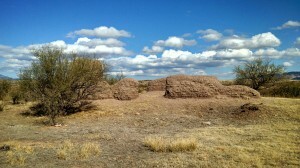 The Los Ojitos Site (LA98907) is an abandoned Late Territorial-Early US period HIspanic Village. Founded around the late 1860s, it lasted until ca. 1940. Architectural features include stone residential structures, stone pen enclosures, rock wall features, an acequia system, petroglyghs, cemetery, and as yet undefined out building remains. These photos are from a 2014 field school. 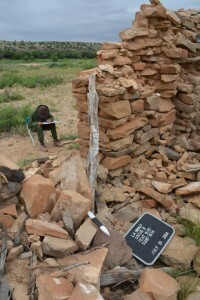 Bottom left, an historic petroglyph; at right, a student recording a residential structure. The purpose of the project is to understand aspects of daily life, subsistence, economic patterns and demographic change. The next phase of the project will be to collect oral histories. 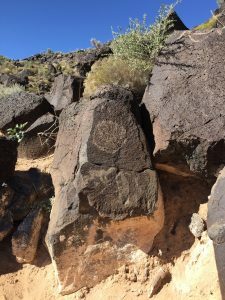 JRI Research Associate Jeffery Hanson has just begun a new project at Petroglyph National Monument (PNM). The purpose of the study is to analyze the distribution of the flute player motif in a landscape setting. The flute player, also known as kokopelli,has a wide distribution at petroglyph and pictograph sites in the American Southwest. The motif has been interpreted as a symbol of water and fertility, and is often associated with water/fertility symbols such as serpents, spirals and frogs. The present study seeks to take a landscape approach to the flute player. The theory is that the motif will be more likely to be found in topographic settings where water might have been available, either seasonally or after heavy rains. 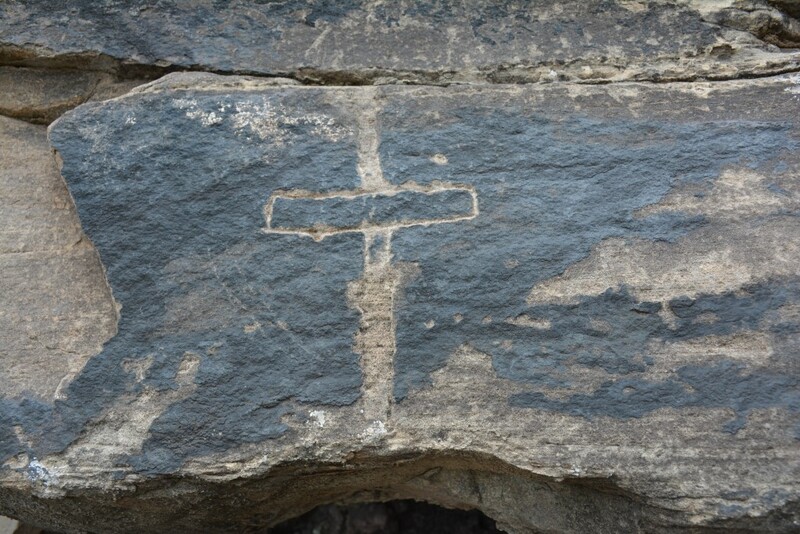 We would expect then to find flute players and other fertility symbols on workable rock faces near drainages, seeps, or springs. The escarpment on the west side of Albuquerque provides an excellent landscape setting to test this idea. The cliff faces from north to south are cut by numerous large and small arroyos that would have acted as runoff drainages during times of heavy precipitation, such as during the monsoon season. These drainages could have produced temporary pools or alluvial runoff that would enhance hunting or collection of wild plants. Placement of the flute players and associated motifs would demonstrate a connection to these localities as places of water, life and fertility. During times of drought, these places might have attracted ritual use as points of communication between shamans and the spirits governing rainfall. In addition these places may have served an ethno-topographic function as a preferred drainage as a water source. Initial observation at the Piedras Marcadas section of PNM has found flute players located in boulder configurations at four drainages. Surveys along the escarpment of Piedras Marcadas Canyon, Boca Negra Canyon, and Rinconada Canyon are being undertaken to document the location of flute players, such as those in thees photos. As of the last week in April,2018, survey of Piedras Marcadas Canyon is near completion. Thus far 80 petroglyph or petroglyph-related elements (grinding slicks, rock alignments, re-located sites) have been recorded. 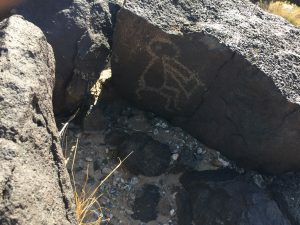 Of the 66 individual petroglyphs or panels that were observed to contain water/fertility-related images, 22 were birds, 18 were snakes/serpents, and 15 were flute players or possible flute players. All of the flute players were found at the heads of drainages, or were overlooking an arroyo, consistent with the hypothesis that they would be found where water would concentrate or could be found at certain times of the year. While some of the other water/fertility-related images were found at drainage heads, they were more widely distributed along the base of the escarpment or in boulder fields on escarpment slopes.